This sample itinerary is an excellent example of what we can customize for you. Contact us now to begin planning your Morocco trip with one of our Travel Specialists. Check out the other activities/workshops we offer here. Today you will arrive at the Menara International Airport and be greeted by your private driver. You will be taken to your accommodations and, depending on your arrival time, have the day free to recover from your trip. 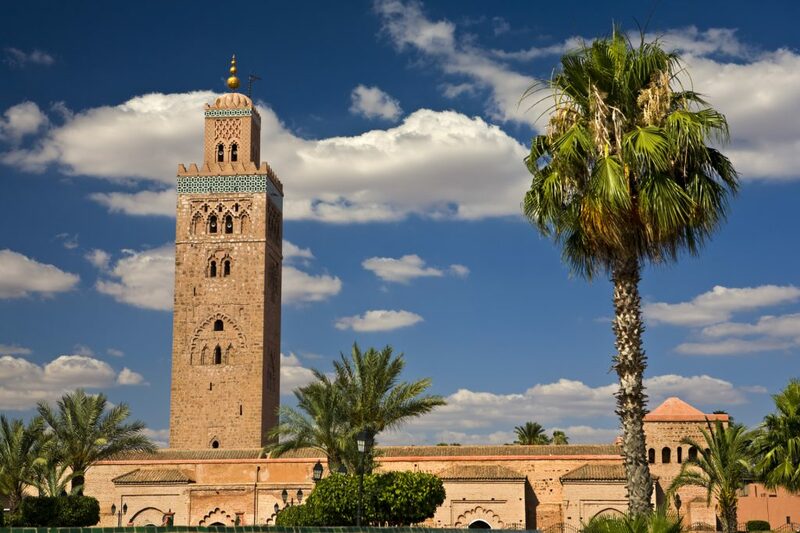 On your second day in Marrakesh, after you have your breakfast, you will meet your local tour guide who will take you on a tour to explore the stunning old medina of Marrakesh, a UNESCO world heritage site. In its vivacious souk, you will be dazzled by the displays of djellabas, soft brightly colored babouches, intricately pierced lanterns, conical mounds of exotic spices and the hubbub of life in the spider’s web of alleys. 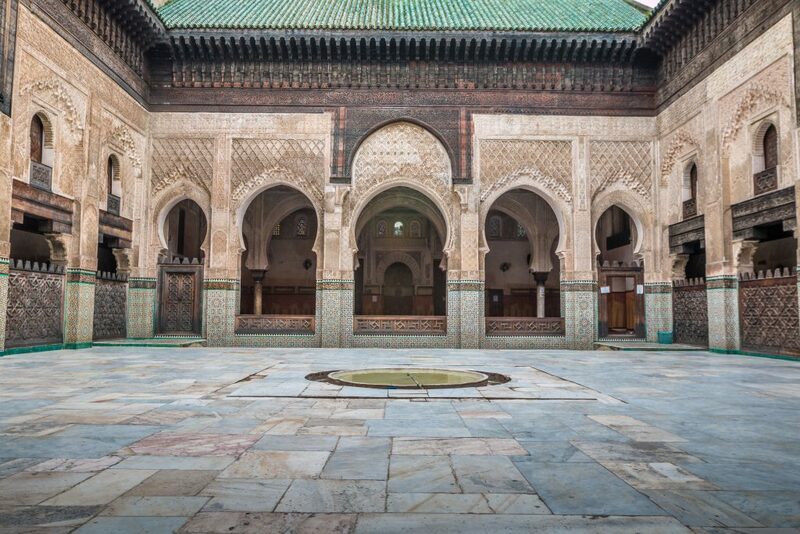 Our humble and energetic guide can regale you with history and stories of the Medina, the Souk, and the Mellah sections all kept within the city’s rose-pink walls. Lunch is on your own with the recommendation of your tour guide. You will never get tired of Marrakesh. In the afternoon you will continue your private tour to explore more of the city. Some of the places you will see are Bahia Palace, El Badii Palace, Majorelle Gardens and Tombeaux Saadiens. Most of the top chefs who work for the Royal family are from Marrakesh, and it has some of the best food in the country, especially the street food that you surely shouldn’t miss. Leave the busy city behind as you head for the desert. This journey takes you up and over the High Atlas. You can often see the highest peak, Mount Toubkal 13,671 feet (4,167m), on a clear day. The Berbers (the Mountain People) live here; to see their villages and to observe their everyday farmland and village activities is fascinating. Their traditional mud-brick homes are seen plus the rapid, recent change to concrete construction. The N9 road continues to snake upwards to the Tizi-n-Tichka Pass (7,415ft, 2,260m), the watershed of the High Atlas. From near to here great panoramic views can be seen, over the mountain range and the road recently traveled. You can see places where they are changing the road to make the drive less curvey. As you descend the pass you will notice the climate as it becomes drier toward Ouarzazate, a town growing rapidly due to the movie industry. Here you have an option to tour one of the 2 movie studios if you like, including an up-close look at some props and sets. The nearby regions have been featured in many movies, portraying landscapes all over the desert, Africa, and the middle east. Departing Ouarzazate, heading eastwards, there is the very important reservoir of El Mansour. It provides water for domestic use, for farming and to generate hydro-electricity. In the very near vicinity is a major solar power plant development. Your journey then travels along the Valley of a Thousand Kasbahs, a Kasbah being a fortified “fort” where chiefs and landowners once lived. Many kasbahs are now in disrepair (having been made of pise mud). Between the small towns of this area, you can see various farming activities, many still using traditional methods. Nomads to are often encountered, herding their sheep, goats, and camels. At El Kelaa Mcgouna, the intensely cultivated plots of farmland are bordered by rose bushes. The rose petals are used in the cosmetic industry. In May a Rose Festival takes place, celebrating the year’s production. Boumalne Dades is a major town, bridging the Dades River. On your second day in Fez, your tour guide will meet you at the riad to start your long day of walking to explore the Medina. This UNESCO protected medina is full of arms-width alleyways and donkey-width roads. Your Fez born-and-bred guide will unfold the hidden stories and tucked away corners, the minutiae of daily life and the magnificence of its madersas and palaces. You see the fabulous Fez as only a true local can know. During the tour, you will not only go to visit the historical schools and palaces but also engage with artisans to learn about their work and stories in becoming masters. A special focus will be on tanneries and mosaic workshops, and the traditional methods still used today in Fez. These are the top artisans of the country, who have been utilizing ancient methods to create beautiful work. Fez is a hub of the Moroccan crafts and arts. Continue from Boumalne Dades to Tinerhir (Todra Gorge) and on to Merzouga, the Sahara, and the Erg Chebbi sand sea. Continue through the desert to the town of Tinerhir, with a great view of the nearby towns the cling to the side of the green river oasis, filled with green palm trees. The surrounding desert landscape reveals impressive buttes, mesa, and plateaus. The Todra Gorge is 984 feet (300m) high and was made by the Todra river, cutting down through red stained limestones. Here you can enjoy an easy walk through the gorge, or relax in the cool water of the shallow river. As you drive through the arid, parched landscapes of the desert you have the option to stop in several small towns, which have lively, colorful markets on different days of the week (your guide can recommend one based on the day). The town of Rissani hosts a large weekly market worth a stop. Be sure to visit the livestock auction as well as the “donkey parking lot”. 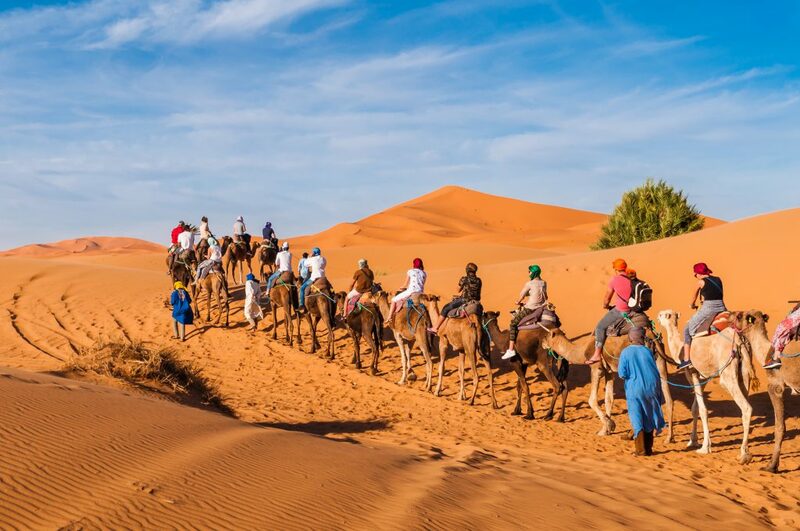 Finally, you will notice the landscape change as you approach Merzouga, the town closest to the Sahara dunes. As you approach you will get your first glimpse of the massive sand sea of Erg Chebbi, looming on the forward horizon. Here the sand dunes rise to over 656 feet (200m), covering a 14 square miles (35 square kilometers). The dunes here are much taller than those near Zagora, but the overall area is not as vast. Here you can take a camel ride into the desert, and enjoy the sunset as you sit atop a large dune. Have a meal and spend the night in Erg Chebbi (in a Bedouin tent). At night, join the local guides for a campfire complete with traditional music and star gazing. If you are an early riser (if not, maybe make an exception this time), then a Saharan sunrise can be just as thrilling as a Saharan sunset. If you are an early riser you’ll be rewarded with a sunrise over the sand dunes. Before setting out across the desert plains, you should consider stopping in Rissani. It is a good place to take a walk around a traditional market, especially on market days when many animals are bought and sold. Be sure to stop by the “donkey parking lot” while you’re here. Today’s journey is truly spectacular, traveling through a remote, empty land that borders the Sahara. The views are vast and extensive, with desert plains, high mountains and plateaus all around. This journey gives a real feeling of the wilderness; it is awesome in its grandeur. Along the drive, you will see Acacia forests with the “umbrella-shaped” trees that specially adapted to the harsh environments. You can stop in the town of Alnif and see the local fossil workshops if you like. You will continue through the Dadès Gorge, which presents a dramatic landscape of ancient rust-red and mauve mountains stripped back to zig-zagging layers of strata and knobby rock formations. A rush of springtime water puddles in the valley where irrigation channels siphon off to fields of wheat and orchards of fig, almond, and olive trees, while a series of crumbling kasbahs and ksour line the valley in the Berber villages of Aït Youl, Aït Arbi, Aït Oudinar, Aït Ouffi, and Aït Toukhsine. You can stop here for lunch on your own with recommendations from your driver. You will end your day in Ouarzazate, a town made popular by its involvement in the growing movie industry in Morocco. There is more to Ouarzazate than movies though, and you can take a guided tour at Aït Benhaddou, a UNESCO world heritage site. This ksars are a perfect example of Moroccan earthen clay architecture and are comprised of many dwellings connected together. Tonight, you will want to retire to your accommodations and enjoy dinner on your own. On the way from Ouarzazate to Marrakesh today, you will go by Aït Benhaddou. It is the most famous Kasbah in Morocco and a UNESCO world heritage site. 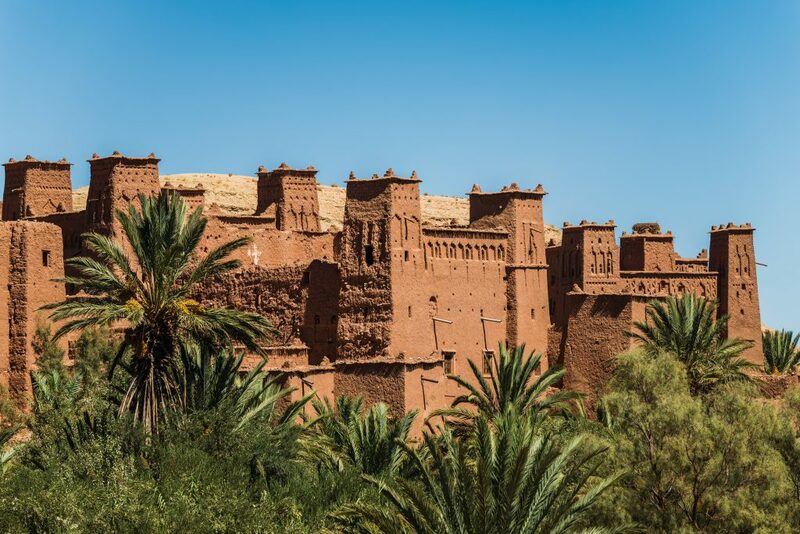 People believe that the old ksar dates from the 11th century when it held an important position along the trans-Saharan trade route between Marrakech, Ouarzazate, and the southern desert. 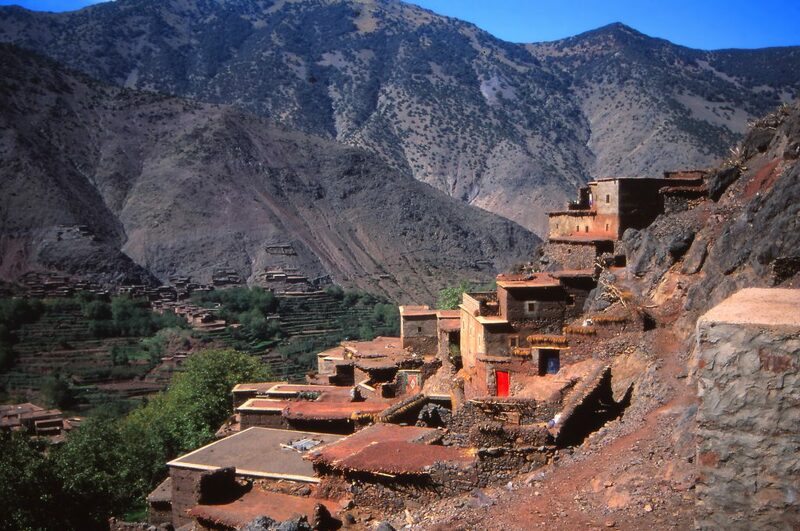 As you head up and over the High Atlas Mountains, look out for the highest peak, Mount Toubkal. Near the top of the Tizi-n-Tichka Pass, you can enjoy great panoramic views over the mountain range, as well as the road ahead that snakes down the mountainside. 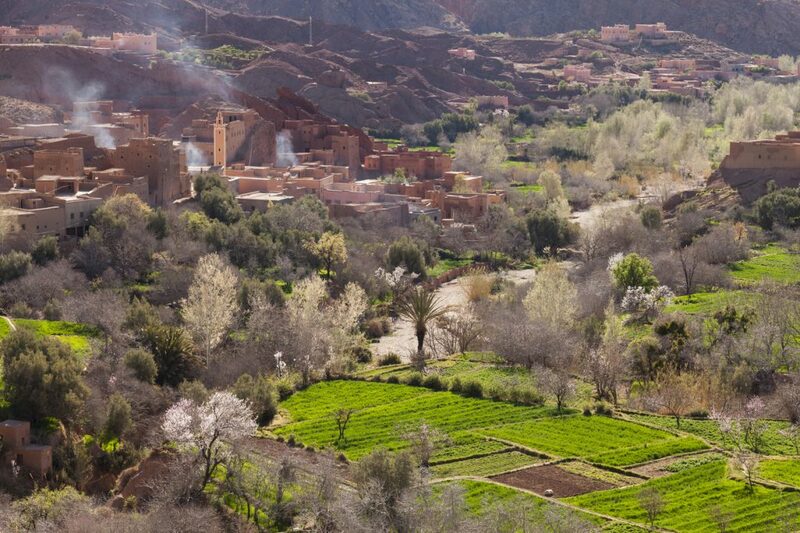 Descending the north facing slopes of the High Atlas you will notice a dramatic change in climate and landscape, with river valleys carved into the hillsides. 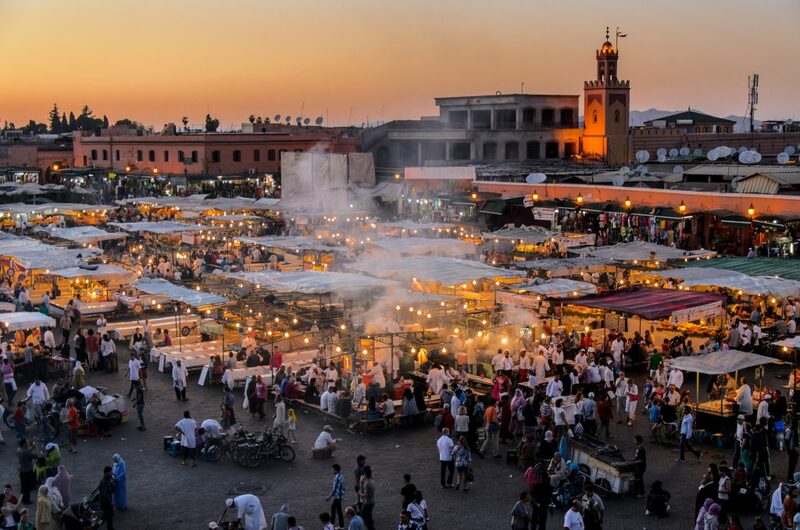 After all the tranquility of the mountains and the desert, soon you will be in the midst of the hustle, bustle, and clamor of vibrant Marrakech. Once in Marrakesh, you may want to spend the rest of the afternoon at a slower pace. You will have a guided hammam (public bath) visit to help you relax after the long days in the desert. In the early evening, the main square, Jemaa el Fna Square, comes alive with musicians, performers, snake charmers, games, food stalls and more. If you want to enjoy from a distance, there are many cafes surrounding the square where you can sit and watch the show over a meal. Dinner is on your own tonight. Today, you will travel to Essaouira, made popular for its excellent surfing beaches. The 3-hour route takes you over extensive, rolling plains. On approaching the western seaboard of Morocco a unique forest is encountered. Argan trees grow only here (nowhere else) and their fruits are very useful. You will make a slight diversion to visit an association of local women that make Argan oil or “liquid gold”, known these days for its excellent health and beauty properties. 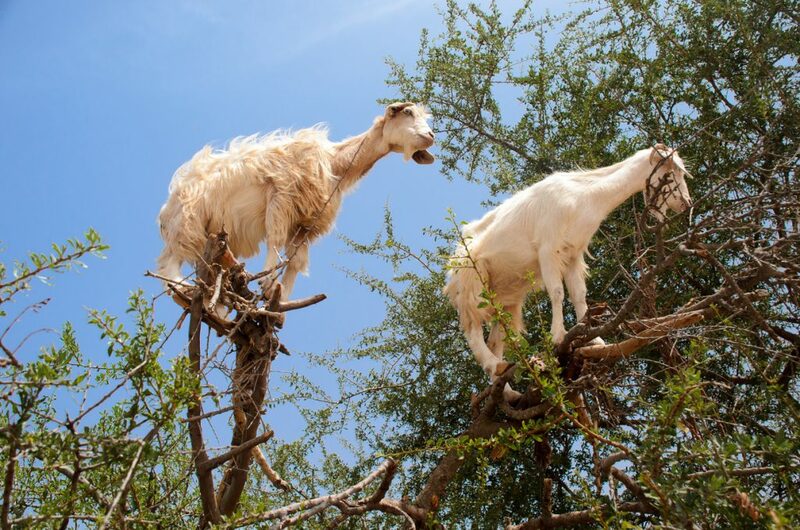 You may see goats grazing on the fruits of the argan trees, high in the tree branches. It is quite a sight! On arrival into Essaouira, you can enjoy walking the impressive seawalls, discovering delights in the Old Medina area, or perhaps enjoying some time down by the very active fishing harbor. Jewish heritage is very present in Essaouira, where one of the best preserved Jewish quarters in Morocco is located. It is a perfect example of a community of coexistence and a very interesting place to explore. Lunch and dinner will be on your own with a recommendation from your driver. Make sure to ask them about great seafood options! Tonight you will stay in a hotel or a riad. After breakfast, you will have the morning to your leisure. For lunch, make sure to have some fresh seafood before heading back to Marrakesh. You will head back to Marrakesh in the afternoon. The evening will be on your own. If you have not already, I recommend visiting the main square, Jemaa el Fna Square, with its musicians, performers, snake charmers, games, food stalls and more. If you want to enjoy from a distance, there are many cafes surrounding the square where you can sit and watch the show over a meal. Dinner is on your own tonight. Depending on your flight time, you may have time in the morning for breakfast and to explore more before your transport to the Marrakech Menara airport. Contact us now to begin planning your Morocco trip with one of our Travel Specialists. Check out the other activities/workshops we offer here. "The trip was excellent. The Riads were First rate, The guides were knowledgeable, professional and friendly. Our driver, Mohamed Samouk, was one of the best parts of the trip. He became our friend, part of the family! We will recommend Morocco Off the Beaten Track to anyone wishing to explore Morocco." "This trip was like a dream, everything went just perfect and as planned. Yassine was incredibly patient and accommodating, he listened to us, responded to every question we had and made sure we would be happy with our finalized itinerary. Our trip started in Casablanca, our flight was more than four hours delayed due to bad weather in Montreal, our driver Mohammed was patiently waiting for us and it was a relief to see him there and greeting us with a smile, we immediately felt welcomed and safe. All of our accommodations were unbelievable nice and charming, it was definitely a huge part of our whole experience, we mostly stayed at riads, which were the perfect selection for us. We were provided with a small cel phone for anything that we needed at any time. Our driver Mohammed was incredibly helpful and friendly, and most importantly, drove us with professionalism and great skills all around Morocco, which involved a lot of driving! I will definitely be using Morocco Off the Beaten Track services again and would recommend to anyone planning their next adventure!" "From beginning to end, we were extremely well taken care of. From our first communication, Yassine patiently helped us prepare an itinerary that was perfect for our group. Once we arrived in Morocco, everything was seamless and well organized. Our driver Mohamed was polite, helpful and charming. He helped make the long drives between cities enjoyable and assured that we were always comfortable. We were quite pleased with the selection of riads; all three were beautiful and special, each in their own way. Guides were polite and well-informed. Ali in Marrakech did a great job choosing restaurants for us, and we had a few memorable and delicious dining experiences thanks to him. All in all, we had an excellent trip and were extremely satisfied with the level of service from KimKim. We would do it all over again if we could. Thank you for a wonderful experience!!" "Trip was wonderful. The contacts were responsive and super-helpful. Our arrival time changed and it was easy to contact both Yassine and Ali and adjust accordingly." "Our entire experience with KimKim was effortless. From the initial and follow-up planning with Yassine to the final follow-up was a great experience. We were met at Marrakesh airport by a young man named Ismael. We could not have asked for a better person to be our driver and to spend the trip with. He was engaging, courteous, helpful and a very cautious and competent driver. Interacting with him was one of the highlights of our trip..."